40mm platinum case, 8.9mm thick, transparent back, platinum bezel, scratch resistant sapphire crystal, silver dial, caliber l051.1 manual-winding movement, approximately 55 hours of power reserve, black alligator/crocodile leather strap, tang buckle. Water resistant to 30 m (100ft). 40mm 18K white gold case, 8.9mm thick, transparent back, 18K white gold bezel, scratch resistant sapphire crystal, silver dial, calibre l051.1 manual winding movement with hours and minutes, subsidiary seconds dial, stop-seconds mechanism, approximately 55 hours of power reserve, black alligator/crocodile leather strap, tang buckle. Water resistant to 30 m (100ft). 38.5mm 18K yellow gold case, 8.8mm thick, transparent back, 18K yellow gold bezel, scratch resistant sapphire crystal, silver dial with stepped down center & further recessed sub-dial, calibre l051.1 manual winding movement, approximately 55 hours of power reserve, brown alligator/crocodile leather strap, tang buckle. Water resistant to 30 m (100ft). 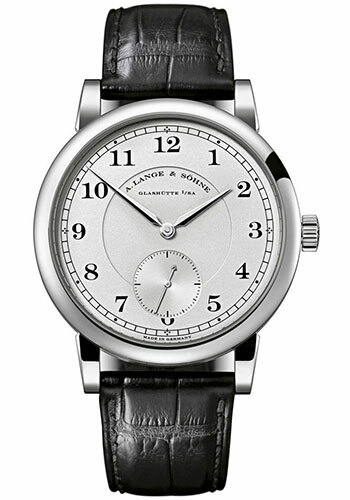 38.5mm 18K white gold case, 8.8mm thick, transparent back, 18K white gold bezel, scratch resistant sapphire crystal, silver dial, calibre l051.1 manual winding movement with hours and minutes, subsidiary seconds dial, stop-seconds mechanism, approximately 55 hours of power reserve, black alligator/crocodile leather strap, tang buckle. Water resistant to 30 m (100ft). 38.5mm 18K rose gold case, 8.8mm thick, transparent back, 18K rose gold bezel, scratch resistant sapphire crystal, silver dial, caliber l051.1 manual-winding movement, approximately 55 hours of power reserve, brown alligator/crocodile leather strap, tang buckle. Water resistant to 30 m (100ft).